One of the best ways to benefit from the Mandala Chart is to put it to use, engage in it physically. If you step into it, like Alice through the Looking Glass, you will discover that it has many new dimensions to explore. The best way is to combine one or more of these for full engagement. This means writing, speaking, and working your way through it until you give your ideas shape, life, and substance so that others can benefit from them. The seeds of your ideas may be mental or intuitive in origin, but their implementation is very much a physical process. The Mandala Chart is a tool to facilitate flexible focus, and we have already looked at templates for the A-Chart and B-Chart, the Mandala Business Diary, the eMandala Chart. Now there is an idea capture tool that runs on the premiere platform of all, the Apple iPad. MandalaChart iPad is an App that will be released in mid-December 2010, available for purchase in the iTunes Store, for JPY 600 (about USD 4.00). This is in many ways the best of both worlds, the tool and the technology, thanks to the portability, connectivity, and sheer elegance of the iPad. MandalaChart iPad makes it easier than ever to capture, present, and implement ideas, view and edit templates, and create a true zoom lens for your life. Its first version will just support text, but the next update will feature hyperlinks and images, and it only gets better from there. The first version supports A-Charts and B-Charts, so that you can start with the standard 3×3 view, zoom out to 64 frames, or focus in depth on a single frame. You can also store your files in folders. There will also be a page where you can download free templates, as well as purchase templates and template packets on particular topics. The MandalaChart iPad App will support multiple languages, and you can preview the page for English-language instructions. 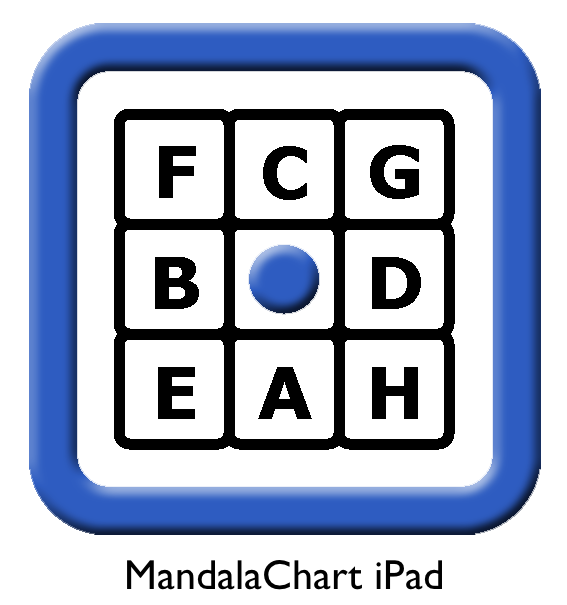 You can download a jpg image called Mastering the Mandala Chart, created in the MandalaChart iPad App, which is also a summary and overview of this Flexible Focus series. If you live in Tokyo, we will be featuring the Mandala Chart iPad, as well as other creativity applications at a special event at the Ginza Apple Store to be held on January 20 (Thu) from 19:00~20:00. The MandalaChart iPad App is a qualitative and quantitative leap above what came before. It will be an enhanced experience of flexible focus, digital navigation, idea capture and sharing. It can be the perfect place to store your notes and action lists from articles in this series. Reading leads to understanding, but only action leads to results. Go back and review other articles in this series, and see if you don’t find points that you had forgotten about, or have yet to take action on. Having your ideas all stored in one place will make it easier to find them. Moreover, the MandalaChart iPad App can be a springboard for action and implementation. Its only limitation is that it only runs on the Apple iPad. The Apple iPad has proved to be hugely successful, approaching sales of 10 million units. There are lots of reasons for its popularity, and this App will add one more. If you are still sitting on the fence, or know someone who is thinking about it, the place to send them is the Apple iPad Page. Templates and content that will be created for the MandalaChart iPad App will help you move along the path From Matrix to Mandala Chart, the subject of an article I wrote for my online column Creative Career Path. The essential idea is that the reason why it is typically so hard to connect thought and action is that we experience lack of certainty stemming from one of two things. Either we are trapped in the limitations of logic, which ignores emotion and countless other factors; or we are trapped in the ambiguity of intuition, which is easily swayed by wishful thinking. The article proposes that the Mandala Chart is the perfect bridge between logic and intuition, incorporating both through fuzzy logic. The MandalaChart iPad App is a significant step in integrating idea capture with idea implementation, just as flexible focus is in integrating thought and action. Flexible Focus #37: Navigate with Nanba! Previous post: Social Media and Tribes #23: Customer service tribe hits a home run!